Hey there! I’m Kate from Chic on a Shoestring Decorating. I’m a budget-friendly interior decorator, DIY-er, and stay-home mom. 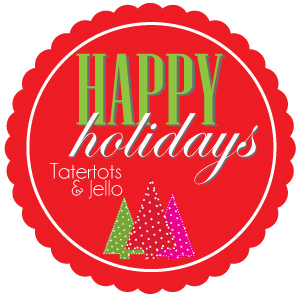 I’m SO excited to be here guest posting at Tatertots & Jello. Jen is such a talented lady and sweetheart, thanks for having me! Today I’m going to share with you a super cheap and easy Christmas craft you can do with your kids… water-less snow globes. This is a great craft because it’s not only cheap and easy but versatile enough it can go for any winter Holiday. Anyway, I’m keeping my extracurricular activities on the cheap. Like dollar store cheap. I got almost all of my supplies at the dollar store (we have Dollar Tree in my neck of the woods). 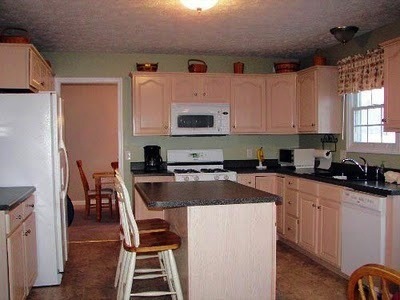 Many of you may have this stuff already in your house which makes it even cheaper! Bottle Brush type Christmas tee (supposedly Dollar Tree had these but I didn’t see any, I got this package of 2 for .75 cents at Menards! (Less than a $1, take that Dollar Tree!) Look near the Christmas Village items at Menards. These only cost me about $2.55 each. But, if you have a jar and some salt already they will only cost .37 cents a piece! How’s that for cheap?! Stick your tree on the dab of hot glue and push it down so the glue spreads out under the base. While the glue is drying, start the fun part of adding snow to your jar. At this point, if your kids are helping you your paper plate becomes worthless as a table cover but salt is easy to clean up so don’t sweat it. Since the hot glue only takes a few minutes for it to dry completely they were ready after the snowstorm was cleared out. If you use super glue you may have to wait longer, you want it to be completely dry. Have your kiddo turn the tree upside down and insert the tree into the jar. Screw the lid on tight (mommy helped with that, that could be a huge mess of salt snow!) Then they can flip it over and enjoy their “hard” work making beautiful water-less snow globes! I’m so pleased with these, I think they are cute enough to keep out all winter! Hope you and your kiddos can make some of these fun snow globes. Please come and visit me over at my blog, Chic on a Shoestring Decorating, I’d love to meet you! 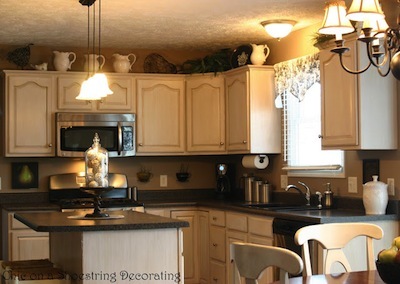 These before and after photos of her Kitchen Update featuring Glazed Antiqued Cabinets speak for themselves. What a HUGE difference, don’t you think? 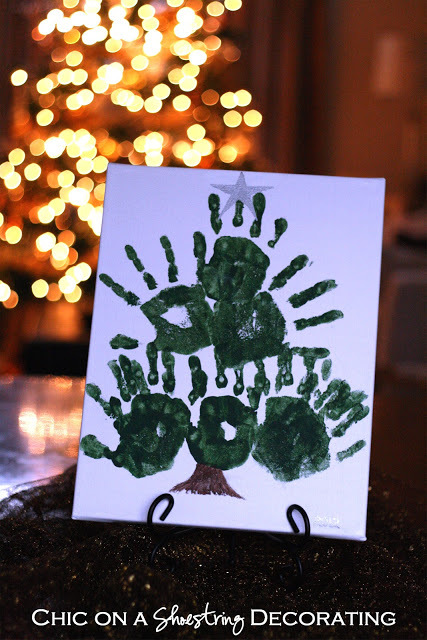 I love this Handprint Christmas Tree. This would be a fun craft to do with your kids during the Christmas season. 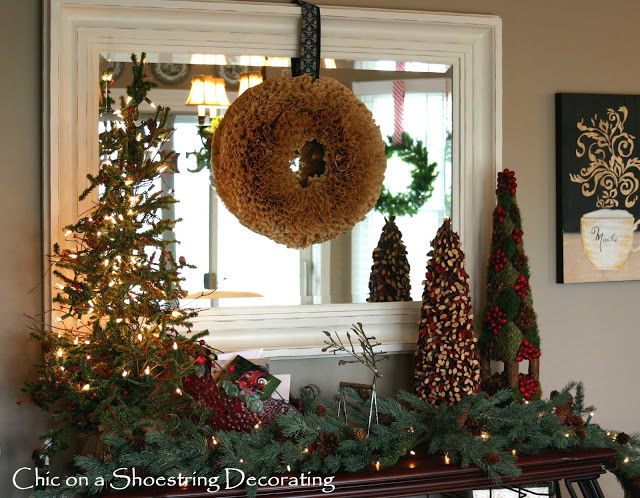 And, her Rustic Christmas Mantel shows off the talent she has for decorating! Such a great and simple art project for my girls! Thanks for the fun idea Kate! !